On 8th Jan'19, I have taken delivery of Thunderbird 350 ABS from Royal Enfield dealer " Him Enfield Dharamshala H.P. in the name of Avtar Singh. At the time if delivery , I was told that I will face issue of ignition going off while driving so I have to open the fuel tank and release the pressure. I thought it must be rare issue but when I drove down 70 kms from dealer location to my residence, I faced this issue almost 12 times and every time I had to open the fuel tank and then restart my bike, which was really very frustating. 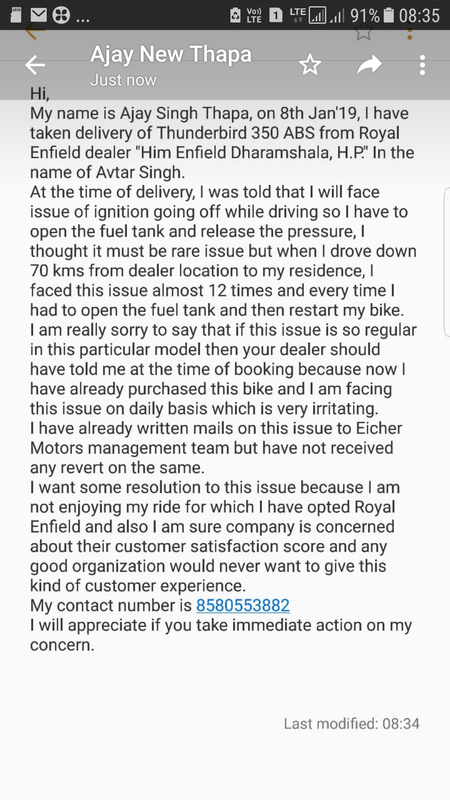 If this issue is so regular in this particular model then company should have launched this model only after resolving this issue or dealer should have informed me about this issue at the time of booking itself.Now I have already purchased this bike from my hard earned money and facing this issue on daily basis which is very irritating. I have already written mails on this issue to eichermotors management team but of no use because I am still waiting for their revert. 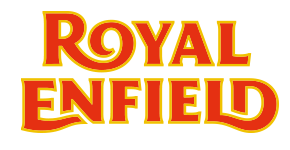 I want some resolution to this issue because I am not enjoying my ride for which I have opted Royal Enfield, also I am sure company is concerned about their customer satisfaction score and any good organization would never want to give this kind of customer experience. I want Royal Enfield team to look into this problem and provide me solution ASAP.